Our central vacuums are versatile options that make cleaning your home or business easier. We are an authorized dealer of Cana-Vac products. The Doc It All provides the versatility of a central vacuum without the installation, automatically storing away the hose on demand. It’s equipped with 142” of suction. All it takes to put in is two standard wall studs and it can be completed in under an hour. The dirt capacity is 1 litre and can reach and clean up to 1,600 square feet. 3 year warranties are available. With central vacuums from Hillybilly Vac Shack, debris is stored in an allergy resistant bag, which is held in an accessible compartment for easy bag changes. Extending and retracting the hose is done with the press of a button. Your electrician can hard wire or the unit or create a “plug and play” connection from and 120 volt outlet. Central vacuum have motors that were chosen for their longevity and reliability. Cana-Vac models have the industry’s best and biggest motors available. Models with outdoor exhaust remove all viruses, pollens, and bacteria, expelling them safely from your home. Regular use of central vacuum systems can reduce allergy symptoms by up to 61%, and the power of these systems are up to five times that of a conventional vacuum cleaner. 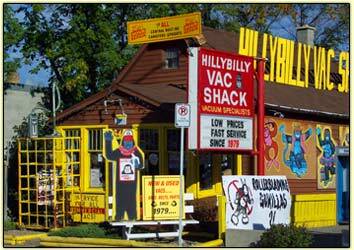 Hillybilly Vac Shack’s professional staff will order, deliver, and install your central vacuum quickly while answering all your questions. Contact us or stop in our store to see all the options we have available for your home or business.